Official Product of Ultimate Arms Gear, Brand New. Backpack Double Stitched Modular MOLLE And/ Or A.L.I.C.E. Webbing System Throughout The Bag and Shoulder Strap So You Can Add On Additional Pouches & Other Tactical Gear. Features 4 Zippered Compartments & Multiple Exterior and Interior Pockets for Organized Storage. Rear Padded Heat Release Cool Breathable Mesh Velcro Panel & Pocket - Hydration Bladder Compatible! (Bladder Not Included). Adjustable Padded & Contoured Compression Shoulder Straps + Adjustable Chest & Waist Straps To Insure This Pack Will Comftorably Stay With You And Balance It's Load Even In The Most Challenging Conditions. Other Feature Include: Double Stitched Carry Handle, Nylon Side Loops For Attaching Carabineers, D-Rings For Hanging The Pack When Not In Us, And Side Webbing For added Pouch Attachment. 17.7" X 9.8" X 5" Main Compartment With An Interior Zippered 9"x5" Nylon Document Pocket And A Mesh 9"x8" Pocket. Superior 900D Nylon Construction. Coated PVC Lining & Pockets for Water Repellency. 12"x8" Organizer Zippered Compartment w/ A Small Interior Pen, Paper & Small Tool Pocket. 6.5" X 4.5" X 1.5" Zippered Accessory Compartment w/ Exterior Velcro. 10" X 7" X 2" Zippered Exterior Compartment w/ Organizer Pocket. Designed & Constructed For The Professional Operator Or Serious Civilian. 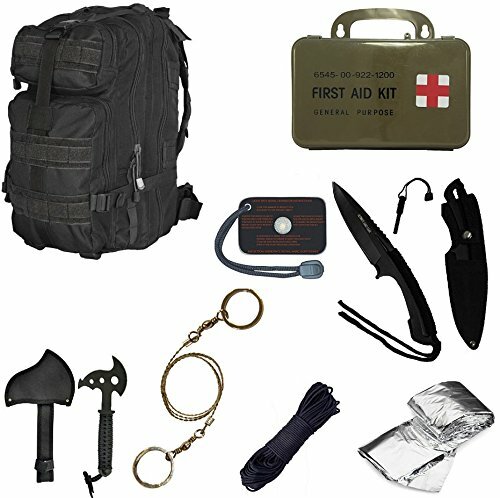 Survial Backpack Includes: Level 3 Backpack + Signal Mirror + Polarshield Blanket + Knife Fire Starter + Wire Saw + Axe + 50' Foot Paracord & First Aid Kit. Paracord:Manufactured In The USA by Certified Government Contractor. GSA Compliant. Official Military Paracord Utility Rope.Top Quality Craftsmanship, Detailed Construction, Improving Every Last Detail. Mil-Spec First Aid Kit is a general purpose kit for any military, camping, or hunting adventure. Plastic case for transport. Alcohol, Iodine, and Antiseptic Pads. Roller Gauze. Ace Bandage. Sterile Pads. Cold Pak. Latex Gloves. Soap. Band-Aids. Tweezers. Scissors. Other First-Aid supplies. AXE-Superior Quality Black Finished Stainless Steel - Perfectly Balanced For Throwing, 10.5" Length, 4.5" Head Blade , Approx 10.5 oz Weight, Para-Cord Wrapped Handle And Tactical Nylon Belt Sheath Included. Knife w/ Fire Starter Full-Tang Stainless Steel Blade in Black. Equipped with Thick Black Cord-Wrap Handle. Nylon Sheath Included with Belt Loop. Magnesium-Alloy Fire Starter. Measures 8 inch Long Overall.